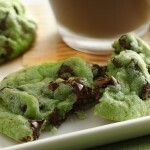 Mint Chocolate Chip Cookies Recipe | Flickr – Photo Sharing! via flickr.com Yummy! My favorite combo is mint and chocolate! I am going to be making these for St. Patrick’s Day. Check out the link to get the full recipe.